Why does North Shore Billet CNC machine their derailleur hangers? Because a CNC machined hanger is stronger, stiffer, and will allow your rear derailleur to shift more effectively. Less deflection at the hanger means more positive shifts, and stronger material means less bent hangers and headaches. 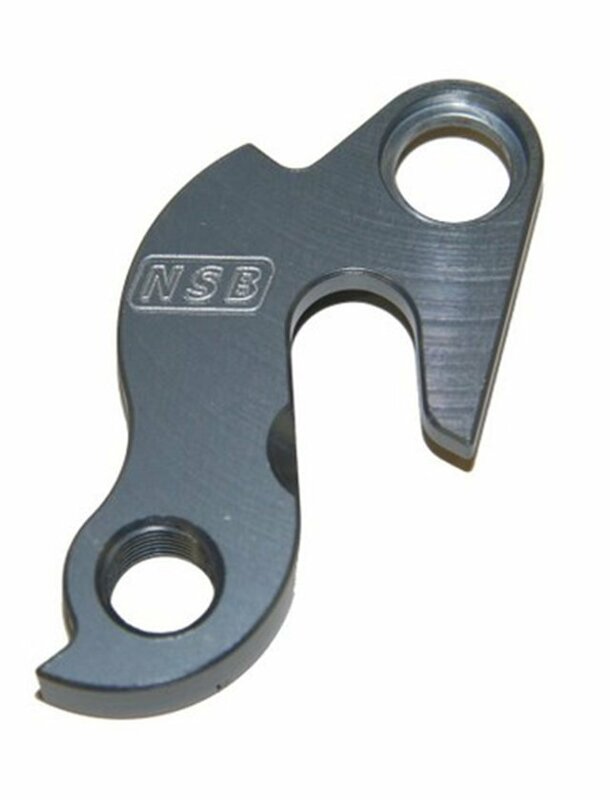 North Shore Billet derailleur hangers outperform OEM hangers because they are machined from a higher grade aluminum than OEM hangers. Please check the fit information at North Shore Billets website to ensure you order the correct hanger for your frame. Nice piece of cnc from NSB, quality hanger. The hanger worked flawlessly, as good as the original!!! Great replacement from the original. After bending the original one my shifting went down hill and no matter what I did to try and band aid the problem nothing worked. I installed this hanger and immediately the flex was gone and crisp shifting was easily had. super light, high quality billet. Better than OEM. Kinda expensive, you can get them for less, but they charge lots of shipping/handling. I threw this in on a bigger Jenson order to get free shipping. this hanger is as advertised. Fit my bike perfect, good quality, mine is for a 12mm 135 rear axle and it mates perfect with the rock shox maxle. Cost effective with good quality! I got it for a 2010 demo 8 and it worked as advertised. Ordered the wrong one, but in worked on another bike. Very cool and solid. Highly recommend as an upgrade! the product seems nice, but its not compatible with my bike. had to return. Perfect replacement for my oem hanger. Not much else to say. good to have a spare in the bag! The old hanger was bent and this was a perfect replacement. Got the variation for the earlier specialized bikes. It works as advertised. I think a bit expensive for what it is but not too many options I suppose. I purchased the version designed for the Specialized Epic. The hanger I received fit in place, but was missing the hole that allows you to attach the hanger to the bike. This version is held in place by the rear tire, so if it is removed it would fall off! Ridiculous. Do you carry the hanger for a 2015 kona process 134? Will this fit on trek fuel ex 8 2016? Yes. check the North shore site. That's how I got my fit. will this work on a 2010 santa cruz nomad carbon?